Speaking following the publication of the final report of the Joint Committee on the Constitutional Amendment on Children, on Tuesday, Sinn Féin Dáil spokesperson on children, Caoimhghín Ó Caoláin, said that the report presented an important opportunity to strengthen children’s rights in the state. “After 62 meetings of the Committee a cross-party consensus was reached on the wording of an amendment to enshrine children’s rights in the Constitution, which is contained in the latest and final report from the Committee,” he said. 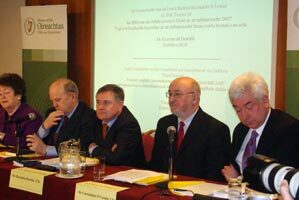 “The representatives from each of the political parties on the Committee agreed that it is now time for a referendum to be held that will ensure children have constitutionally recognised rights as individuals, beyond those derived from their status as members of a family as defined in the Constitution. “Sinn Féin believes that this report is an important step on the road to cherishing all children of the nation equally. It is now up to government to take the wording offered and hold a referendum that will afford children specific rights to care and well-being and their right to be heard in matters concerning them. “The amendment should also go some way to addressing the obstacles affecting child protection systems. If an amendment such as the one contained in the report was enshrined in the Constitution, the State would have sufficient power to intervene on behalf of all children at risk regardless of their parents marital status. The principles of the UN Convention on the Rights of the Child have been reiterated in numerous international and national treaties and the proposed wording in this report is linked to principles contained in this Convention. It is now time we began to take a rights based approach to how children are treated in our laws and policies.